2014 was a rough year for my relationship with The Balvenie. The discontinuation of my two favorite bottlings (Single Refill Bourbon Barrel 15 Year and Tun 1401) had me questioning the direction of the brand. In the case of both expressions, they were soon replaced by something else. 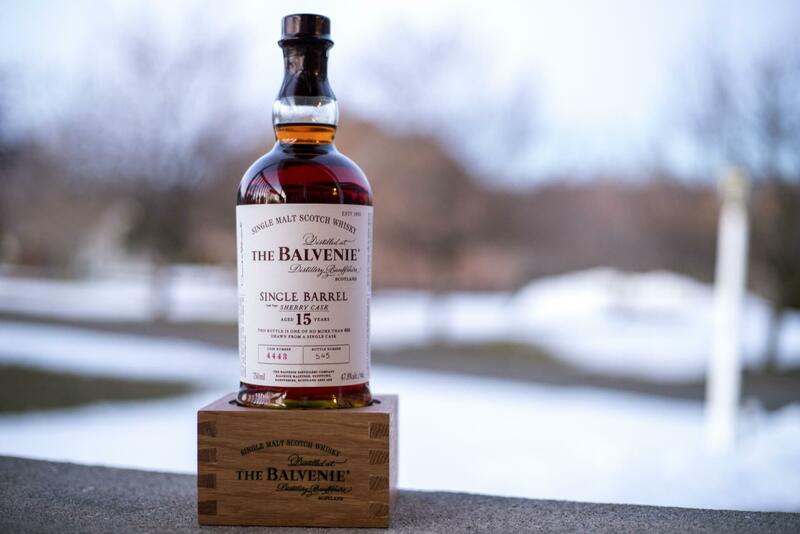 I’ll leave the Tun discussions for another post but in the case of Single Barrel, the ex-bourbon release was replaced by The Balvenie 15 Year Single Sherry Cask. I actually predicted that The Balvenie would come out with a single sherry cask expression years before it happened but I always assumed it would be a complimentary release, not a replacement. I assume that this decision was made in part because they need those ex-bourbon casks to replace ever-dwindling aged stocks (perhaps for use in the popular 17 Year Doublewood bottle or the 21 Year Portwood). Similar to the Single Barrel release that it replaced, each bottle from the new release is from a single sherry cask. Balvenie was the first distillery to make a single barrel bottling part of the standard range and they continue that tradition today. You can usually tell if your bottle is first fill or a refill sherry cask by the color. Like its predecessor, this release is bottled at 47.8% ABV is is non-chill filtered. Nose Dried fruits, molasses, big spice. Also big on the raisins. With water, a maple syrup notes emerges. Taste The dried fruit continues, including prunes, hints of leather, slightly astringent oak, thick and creamy, more of a caramel sweetness here. Actually a bit hotter with water, I think this is because of an increase in spice. Dried fruits are still here as is the oak. Finish A thick finish, mouth coating, lots of spice and berries. Oloroso sherry notes. With water, cherry cough drops. Also, I found the vanilla again! Overall Thoughts I like this expression almost as much as the discontinued ex-Bourbon 15 Year Single Barrel thought they are two very different types of whisky. It really just depends on what type of Balvenie I'm in the mood for.